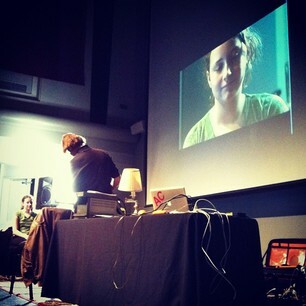 The student workshop was presented Sunday afternoon by Boulder Digital Arts in conjunction with the Boulder Film Festival. BDA is an amazing resource providing classes, events, technology and space to creators in the digital arts. The workshop was free to students 13 to 18 and was well-attended by students in a wide age range and various filmmaking goals. Cooper’s focus was on the technology and logistics of filmmaking and he started by outlining his five steps: concept, plan, shoot, edit and show. The workshop was interactive with students coming up to demonstrate casting sessions, recording dramatic dialogue, what colors and patterns to watch out for on an actor or documentary subject, lighting, and the pitfalls of automatic aperture. Cooper did a nice job weaving together general information with individual anecdotes and details and also noting what one would absolutely need versus what you might hope for and what would be ideal in filmmaking in terms of equipment. It was well-directed to the audience. In the sound section he gave examples from his work and stressed that although it may make things more complicated that getting the characters out doing what they do, where they do it will make a documentary or corporate video much more compelling. He also noted and came back to the need to capture close ups and b-roll and other tricks-of-the-trade to make cutting a documentary possible. Cooper's low-key nature made for an inspiring workshop that will encourage students to believe that they really can make a short film and get their work out there. The students are very lucky because they've got the chance to attend to that workshop that is all about making a short film. I'm pretty sure that in the future the students will be able to produce a film that is worth to be watched. Very useful information on making an amateur film. These days people have lots of camera, professional or otherwise. Budding film makers attending such a seminar has a head start.